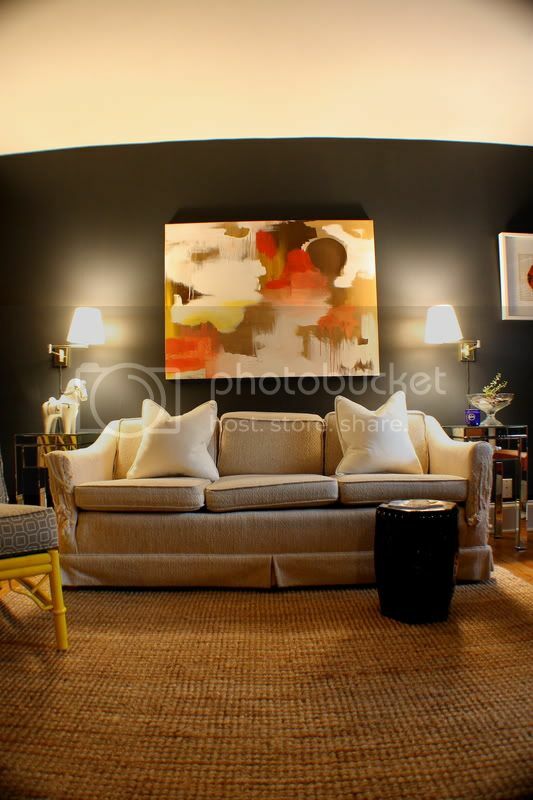 Kristen F. Davis Designs: new living room look. so, as i mentioned last week, i did a whole lot of painting in this place. painted the walls (black horizon by benjamin moore, which i borrowed from this client's project. we used it on the dresser, and it is the black on the wall. it's a cool midnight blue-black. ), the ceiling (standard ceiling white), and the bookshelves (a dark gray color that i hand mixed). i'll get you guys better pictures of the sofa, and soon i'll show you my bookshelves, but for today, i thought i'd give a little early peek of my sofa area. anyway, as you know, i sold my side tables and coffee table, so for now, i just have the little black garden stool sitting in front of it. there will be a real coffee table on it in the near future! i bought those mirrored side tables from target. i'd like to replace the knobs on them, but i haven't done that yet. the yellow chair you are seeing to the left (i'll give you a more detailed tour soon!) is from scarlett loves rhettro here in atlanta...i painted it a high-gloss yellow. and, last but not least, i did that painting thats above our sofa yesterday, as inspired by a painting that i saw in lucky magazine this month. oh! and i got the little brass swing arm lamps from goodwill last week. i bought the shades at lowe's. Wow it looks like a totally different room. I am loving the changes thus far, but I, of course, expect nothing less than fabulousness from you! I'm excited to see the finished product! :) Great find with the light fixtures!! I wish I could find some of these because I have been wanting some for my bedroom, so I can free up space on my nightstands. I love it! Did you create the painting?! It looks great on the dark walls! I LOVE the painting that you did against that wall color- gorgeous! LOVE the painting! I want one! I have one of those mirrored side tables from Target! Pretty good little buy. Looking good! This looks fantastic! A complete transformation. I never thought Id be down with black paint. I stand corrected. LOVE! Two totally different looks! Its coming together awesome! BTW, Gorgeous painting! LOVE the black paint! ....and LOVE the Goodwill find! I love that painting and the drama of your new space! Curious what else is on your list for this room! I read your blog often, but don't normally comment. I just had to come out of the woodwork to say i love that painting! Totally digging that paint color. And especially the inspiration photos from the nursery. We are having our first kid in August and nurseries have been on the brain. Love how unique the one you did is! Wow, what a difference the black makes and I love your painting. Lookin' good!!! What an amazing transformation! Gorgeous, ripped sofa arms and all! I really love the black walls and your gorgeous abstract painting! Great job! Really fabulous. I love your black, it is so dramatic. I can't wait to see the finished product. Looking good so far! I'm really feeling black interiors these days. Your living room looks fantastic. 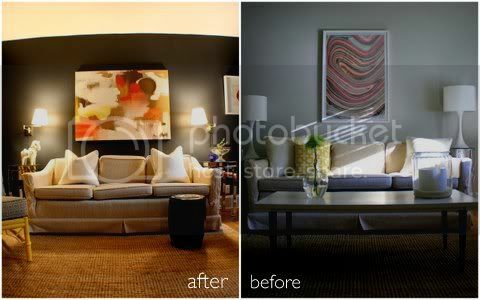 It has a fun modern edge to it and very dramatic with your dark walls. I love your yellow chair in there. Great job! Your painting is the perfect touch. Wow!! that black wall is stunning! The room looks amazing! do you think a dark grey would have a similar effect ala Farrow and Ball's Downpipe? I got here from the search query "cat scratched to death with intestines hanging out". Thought you'd like to know. Lovely art though! Cheers!